I've said it before, but I'll say it again - I like organizer pouches. They just make life better when you have smaller items to keep track of and access regularly. 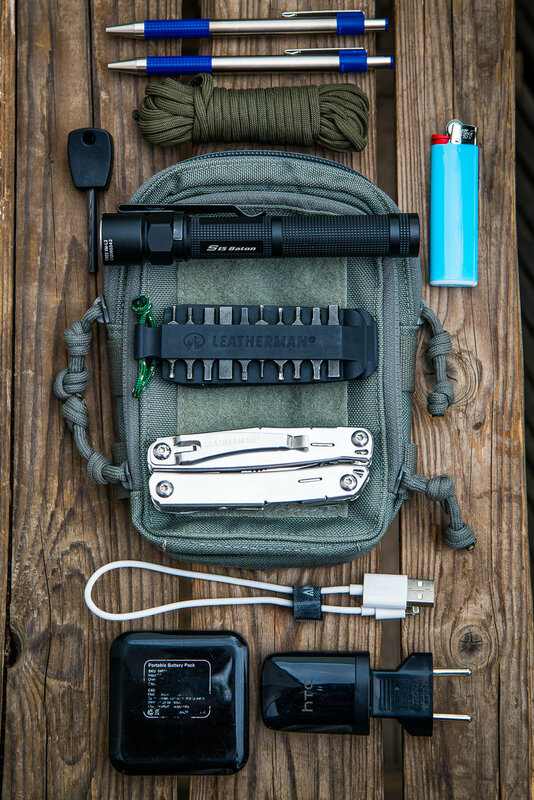 One product worth your consideration is the Stealth Compact Pouch from Milspec Monkey. This is a collaboration between MSM and Tactical Tailor, so it built to high standards in the USA. It is a good size to be used on the side or a pack and suits a variety of items well. Tools, double stack pistol magazines and flashlights all fit well, as do smaller items such as pens or lighters. These run less than $40 and available in a variety of colors (mine is Foliage Green) to match your pack. Check them out here for more info. Looking into the smaller front compartment. Looking down into the main compartment. The front side of the main compartment, turned inside out. The rear side of the main compartment, turned inside out. The bottom of the pouch, turned inside out. The basic kit I carry in the pouch.